Contraption Cave is a level in the Jungle World of DK: King of Swing. It, along with Tropical Treetops, is unlocked after the Banana Bungalow level is completed. The level brings back pegs and peg boards from the previous level, and also adds several new mechanisms, such as levers, wheels that Donkey Kong can spin to move them up and down, and tires. Kritters, Neeks, and Flipflaps also make their first appearance in the game in this level, and Flitters reappear as well. Barrels also make a reappearance in this level. Like most levels, a Crystal Coconut and a DK Coin are available in this level. At the beginning of the level, a rectangular set of peg boards can be seen above with Neeks climbing around the perimeter of them. Single pegs are above these boards, and a Kritter swings along them. Two parallel sets of peg boards are above, and they are followed by two symmetrical groups of pegs. Kritters climb around these as well, occasionally jumping from side-to-side. A small peg board with a Banana Bunch on it can also be found between the two groups of pegs. If Donkey Kong travels higher up, he reaches some peg boards placed next to a ledge. If he travels across the ledge, he enters a new area. In the second area of the level, many levers can be found. Each of them in this area must be grabbed with both hands to activate. When the first lever is pulled at the beginning of the area, peg boards appear under some barrels placed above. Donkey Kong can use them to reach the barrels and break them. Another trio of barrels is on the peg boards above the he must destroy to pass as well. There is a small group of pegs nearby that have a lever above them. With both hands, the ape can pull down the lever to make some peg boards appear that can help him reach another lever. When this is pulled, peg boards appear nearby around an already-existing peg board with a Neek traveling around it. One last peg board is above here that can be used to reach another ledge. A lever is above here, and if Donkey Kong pulls on it, a small peg board appears ahead the can help him reach a Bonus Barrel. 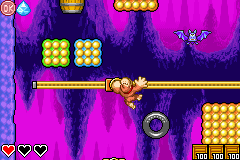 If the ape travels along the aforementioned ledge, he can enter the third area of the level, where there are several wheel devices that can be turned to make the wheel move; if the ape holds onto the wheel as it turns, he can be pulled upwards by it. A Bat is placed between two vertical bars that the wheels move on at the beginning of the section. Tires are scattered all around here. A horizontal bar with a wheel on it is above the two vertical bars, and a few peg boards that can be used to climb are also beside it. Another horizontal bar is above a few peg boards. Donkey Kong can move along the wheel on it to travel towards some peg boards to the left side of the area. Peg boards are also above here, along with a Bat, a barrel, and one last horizontal bar; a DK Coin is revealed when the barrel is hit. The wheel on it can be used to be pulled towards a ledge with an exit sign on it. When the ape lands next to the sign, he completes the level. The second area has a Bonus Barrel near the exit. The bonus stage has a time limit of 35 seconds to break all of the barrels in the area. They are rewarded a Crystal Coconut for doing so. Regardless of the outcome of the bonus stage, the Bonus Barrel will disappear upon exiting. 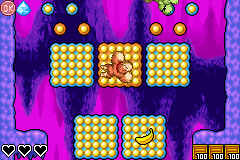 A "Going Bananas" move must be used to break them all within the time limit. This page was last edited on April 5, 2019, at 12:44.